RICHARD VAREY has been hard at work indulging his inner audiophile. In the first of a two part review of a trio of products, he takes a close look at Metrum’s Adagio digital preamp DAC and Forte power amplifier. And his verdict? Over several months I’ve been reviewing a trio of interesting products recently introduced to New Zealand by importer Critical Sound. I began with the Metrum Acoustics Adagio digital preamp DAC running my Sachém V2 monoblocks and driving my Audio Pro Avanti 100DC floorstanding loudspeakers. After a few weeks with the Adagio, I was able to hook it up to the Metrum Forte power amplifier in place of the Sachém. The next addition to the system was STS Digital CDs, followed by Albedo Aptica loudspeakers (which I’ll cover in my next review), and then STS Digital DMM vinyl albums. As a writer, and former business communication researcher, I find word choice fascinating, so of course I looked up the Metrum name in my dictionary and thesaurus. Essentially, it’s all about measurement. It seems that everytime I investigate another audiophile equipment option, I discover a further level of performance ever nearer the sublime music playback experience. This should be no surprise, since it’s what motivates me to explore different ways of playing recorded music. With the Metrum Adagio, designed and built in the Netherlands, it has happened again, and the Adagio digital only DAC/digital preamplifier DAC has taken pride of place as the most appealing hi-fi product I have had the privilege of connecting to my music library. The concept is simple and very appealing. Take the non-oversampling (NOS) concept of the highly acclaimed Metrum Acoustics Pavane DAC, which was ebulliently reviewed by Andrew Baker right here on Witchdoctor, and turn it into a digital preamplifier/DAC. That is, the Adagio is a DAC with USB, balanced XLR and coaxial inputs that has a carefully integrated lossless volume control, so you don’t need a separate preamplifier. It can be used as a DAC or as a preamp with integrated DAC. The design aim was to realise analogue sound from digital equipment, in response to a weakness in much digital playback gear. Electronic component manufacturers often use the technique of ‘oversampling’ or ‘upsampling’ in their digital-to-analogue chipset, forcing equipment designers to adopt this method of signal conversion for their own products. The sampling techniques were introduced to ‘smooth’ the conversion process from digital to analogue and prevent phase distortion. Many brands use the same building blocks and consequently sound the same. In the early years of CD replay, conversion methods proved to be sonically inadequate and, in response, strong filtering methods were employed, thus the oversampling technique was born. This has disadvantages which manifest in transient response, for example. Nowadays, ‘non oversampling’ (NOS) provides many benefits without the compromises. Extensive research for the Metrum Acoustics range has found the audible benefits of NOS to some extent valid. But how can sonic artefacts be removed without resorting to oversampling? This question was answered in Metrum’s first products, the NOS Mini DACs Duo and Quad – digital to analogue converters designed and manufactured with modern high speed industrial grade chipsets free from most of the disadvantages. These techniques have been improved over time and used in the entire range of products. The most important result is the sound rendering, which has never before been so close to the analogue original. Metrum’s current flagship Pavane model has proven superior, and they’ve now added a proper volume control so a separate pre-amplifier is unnecessary, which improves performance dramatically. Having such a device in the signal chain can have a negative effect, so experiments were made to resolve this problem. The result is the best sound coming directly from the Transient modules. To change the reference voltage of the DAC, dedicated boards were designed to get the best regulation possible in changing the output voltage. As in the Pavane, ‘forward correction’ techniques are used to drive both mono DAC boards. The result of this process is extremely high linearity, down to -155dB (2V RMS), which gives the Adagio a realistic 24-bit dynamic range. 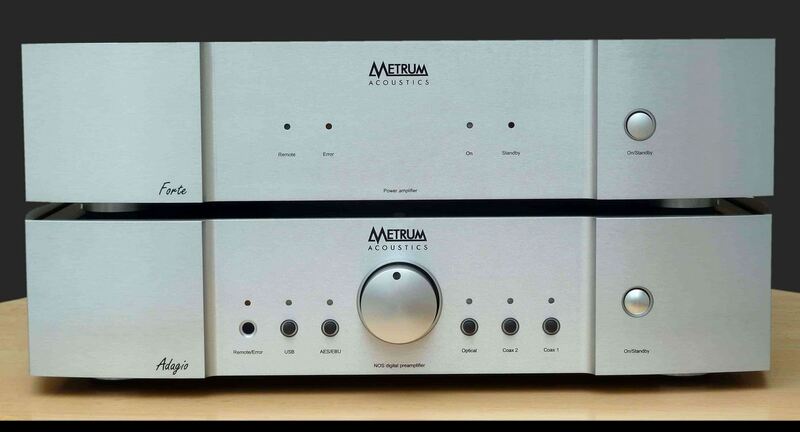 The Metrum Acoustics Adagio pre-amplifier is a continuation of the theme which began with the Adagio DAC. The Adagio uses eight 24-bit Transient DAC TWO digital-to-analogue converter chips. 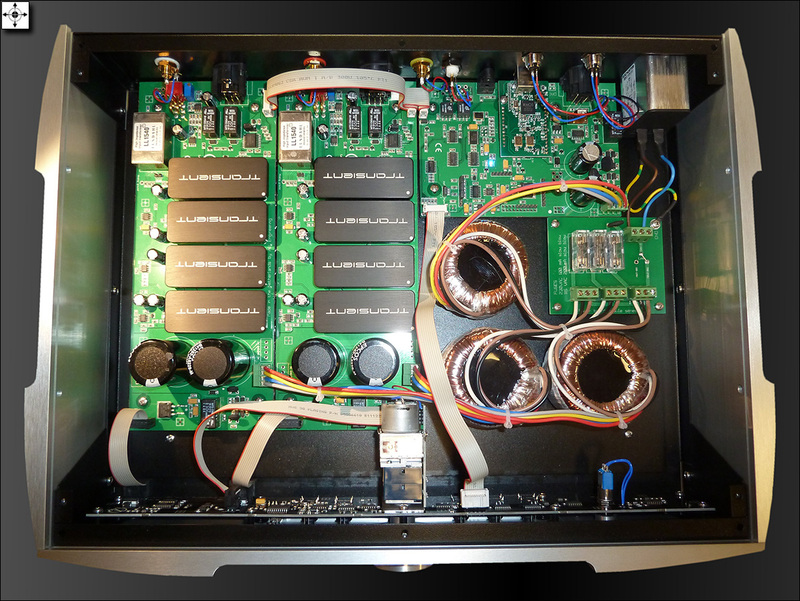 Two fully balanced mono DAC boards are used, each with dedicated separate power supplies. Incoming digital audio data is split into two data streams and feeds the DAC boards. The analogue output level is controlled by the setting of the reference voltage. This approach avoids any gain stage and connects the DAC modules directly to the output. 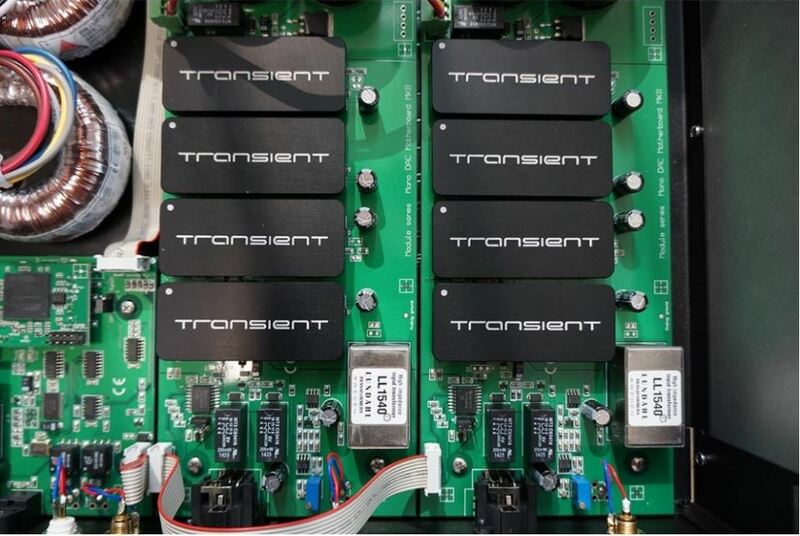 With the removal of a separate preamplifier and interconnects, a direct path with constant impedance is created, facilitating the best operating relationship with the power amplifier. Because the modules need some voltage to work, it is not possible to go to zero volume (some sound can be heard when music is playing) – so to achieve true zero, there is a mute function. To match Adagio to highly sensitive amplifiers, there are switches for each channel on the back panel. They lower output by -10dB; about 700mV RMS. As standard, it has 1 x BNC, 1 x RCA, 1 x optical, USB, and AES digital inputs, and a pair of RCA (single-ended) and a pair of XLR (balanced) outputs. I noted that the Adagio’s XLR and RCA outputs are switchable and so can be used simultaneously for bi-wiring. Lifting this unit from its carton, I’m struck by the weight (10kg) and the substantial silver metal and black glass case. Obviously, this is in no way anything of a lightweight. Build quality is excellent – the unit looks and feels like serious and careful engineering. Few controls are needed and the push switches for source selection and substantial volume knob are silky smooth and silent in operation. Rear sockets are obviously high quality. The ‘Fire Stick’ remote control handset is black and metal, and rather cold to the touch, and the buttons rattle (a minor distraction until you get used to it). The user manual (provided as a PDF file on the enclosed USB stick) is brief since the setup and operation is so simple – for a Windows PC, install the supplied software driver from the rather stylish wood-encased memory stick (no driver is needed for Mac and Linux), connect digital sources, switch the unit on, select the source, disengage the mute function, raise and lower the volume using the remote control or volume knob. That’s it. I was playing music from my PC within five minutes. I use JRiver Music Center 21 on a Windows 10 PC – the Adagio shows up as hiFace TWO UAC2 [WASAPI], [Kernel Streaming], and [Direct Sound], as well as MUSBAudio ASIO. I listened with each connection option, without hearing any difference in sound quality. The sample unit was supplied with about 100 hours use on the clock, and it was suggested by the dealer that it was likely the sound would open up further with use. I can confirm that I have been delighted throughout my trial. Interestingly, it was suggested that additional detail and changed tone might be the effect of acclimatisation over a few days, as my listening adapts, rather than from any change in the performance of the machine. I was curious to give this some attention over the course of the trial. Driving my Viganoni Sachém v2 monoblocks and Audio Pro Avanti 100 DC, it was very obvious from first track heard that the presentation was magnificently crisp and clear. I connected my Pioneer D6 SACD Player via coaxial output, and settled to listen to Tracy Chapman’s Greatest Hits. Impressive! The emotional engagement was very palpable. My wife, who is a casual listener and not at all audiophiliac usually asks me to turn the volume down, yet this time she listened without comment. This audition was notable, as I’ve remained an avid vinyl record listener since my late teens, so this digital-only concept is new to me (and at first felt a bit odd), and I think that the Adagio has given me a rather nice introduction. While I missed being able to play a vinyl record, the musicality of my digital experience, both CD and file playback, was well compensated. However, clearer instructions on installing the software driver is necessary. It wasn’t obvious to me that the M2TECH driver was the correct one, especially as it is supplied in a sub-directory labelled USB module 3 driver, within a sub-directory that doesn’t mention Windows 10, within a sub-directory that is not labelled Adagio. Once installed using the supplied setup application, it ran flawlessly first time. While it turned out to be easy for me it wasn’t readily intuitive, and not everyone has 30 years experience using PCs and the familiarity with DACs that I have developed by reviewing a large range of equipment. My educated guess proved correct, but the manufacturer could easily provide the setup in a more user-friendly fashion. The Adagio DAC does not alter the signal coming from the file server: it does not upsample, oversample, or filter. This creates a highly satisfying – and neutral – music listening experience. I didn’t look at the price of the Adagio until I had extensively used it to listen to my music. I didn’t want to make an assessment influenced by the price tag as the primary marker for sound quality expectation. After much music enjoyment, I have concluded that the value proposition ‘analogue from digital’ works very well. Actually, within half an hour of switching it on, I wanted one for my system. That I can’t afford to buy one is another matter. I have become a NOS and Metrum Acoustics fan. So, I was delighted to be offered a related product for further auditioning. Also in the growing range of products is an interesting amplifier. 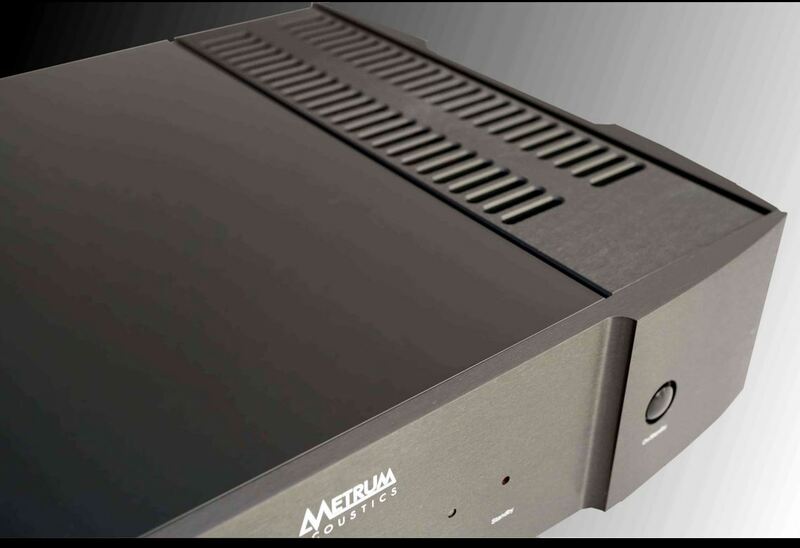 Among Metrum’s growing range of products is an interesting amplifier, the Forte, the design and build of which matches the Adagio. Many of us crave the euphonic sound of music that is rendered through vacuum tubes. It has a more natural sound character in terms of timbre, for example, explained in part by the even order harmonic distortion present that is heard as ‘warmth’ in instruments and soundstage ambience. But valve users can be frustrated by the strong possibility of experiencing microphony, the likelihood of background noise, the heat generated and the inevitability of wear-out degradation creating sub-optimal operation and eventual failure. Oh, and the cost – valve users have to accept that valves are sometimes costly consumables. They operate somewhat like a filament lamp. It’s a 100+ years old technology and these mechanical devices, with a heater like a light bulb, are inevitably prone to the sonic equivalent of dimming, maybe flickering, and then burn-out. Another pause for thought in considering valve amplification is the warranty on valves. While a new amplifier, especially solid state models, will usually carry a 2-5 year guarantee, valves typically are warranted against failure (but not sub-optimal operation) for 90 or 120 days, or exceptionally six months for new tubes. Used valves are more risky, as provenance may be clear but usage history less so, and typically 30 days replacement of a failed valve can be expected, including NOS (which may be as old as 50 years). The Metrum Acoustics Forte has a very appealing proposition. Get the sonic benefits of valves, without the electro-mechanical compromise of degradation through use. Metrum has long used hybrid (triode) amplifiers for pleasure listening and critical evaluations. They didn’t like the aging problems of triodes, so they set about creating an alternative and, with simulation software, they simulated triodes with FETs. Triodes are good for low gain and a lot of bandwidth without any need for feedback. Metrum was able to realise a full Class A high voltage FET circuit with the right gain, very good open loop bandwidth and low noise. The high voltage of 350 Volts to run the circuit produces outstanding linearity without any feedback. The circuit is driving a class A/B output section (10 Watts in class A). A little feedback is necessary to get the right gain, but this also improves the damping factor. Compared to their old hybrids, there’s no sonic difference, but there is less noise and lower distortion. 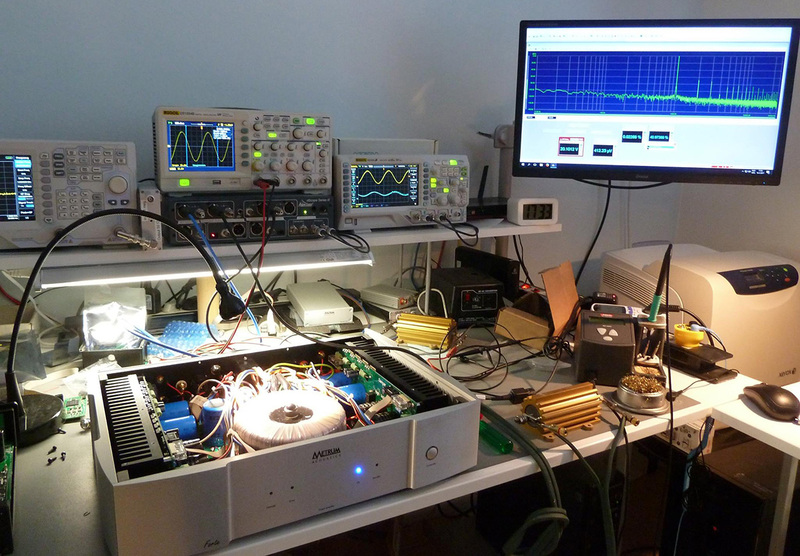 After two years of prototyping and testing, the Forte amplifier was created. The circuits are quite overdimensioned to be sure no errors occur. They added a lot of protection to avoid any damage to loudspeakers in case of malfunction. A soft start procedure is added to charge the huge capacity of 176,000µF that is available during complex and dynamic transients. It’s well known that such hybrids combine holographic tube sound and the outstanding control of transistor designs. It is claimed that ‘this amplifier sounds very natural over the entire power range. None of the very often (cheap) differential input circuitry is used but instead low gain tube simulated FET circuitry makes this design one of the most relaxed and natural sounding amplifiers’. Since introduction some minor improvements have been made to the driver circuitry, and more noticeable is a structural brace which clamps both heatsinks to strengthen the design. So is that what I heard when the Forte was driving my Audio Pro Avanti 100 DC floorstanders? At this stage of my extended audition, which ran to several months, the Forte amplifier was added to the Adagio DAC preamp to drive my own loudspeakers. Later we substituted Albedo speakers from the Critical Sound range, which we’ll discuss in my next article. This is a ‘strong’ amplifier. By that I mean that it looks and feels very substantial, and in use conducts its business at all listening levels with a great sense of ease. The switch-on protection routine is reassuring, and volume control using the remote is ultra-smooth and consistent. Despite some long listening sessions, the Forte never got hot. Sound quality was exemplary, with the anticipated continuity and roundness that valves are renowned for, and no hard edge or glare that was once the necessary evil of digital amplification. Fine detail was clearly rendered, and dynamic recordings were rendered very convincingly. As examples of a testing recordings, I play Charly Antolini’s drum recordings and Dennis Chambers’ drumming on the live album DBIII Live at The Cotton Club Tokyo. At all volumes it sounded like I was hearing the live performance. Those recordings captured very dynamic performances with wood, steel and skin clearly discernible in all their natural timbre. Remote control integration with the Adagio is available when the units are linked with the proprietary interconnect. This matched combination of DAC and power amplifer created some of the most absorbing music listening I’ve experienced. For five decades, Richard has assembled music systems that enrich his music listening experience. He writes about the electro-mechanics and social psychology of this technology-facilitated art we call high-fidelity music reproduction, and about his experiences with interesting hi-fi ideas, equipment, and the people who make it. And a ‘note’ re Price – $10,995 Incl GST.